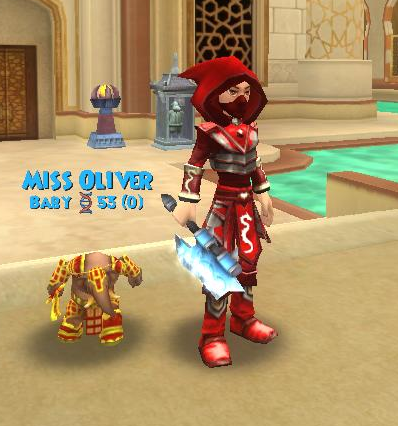 SO at level 48, in addition to the amazing Fire Dragon spell, I got a new pet – the ‘School Pet’ for Pyromancers, a Helephant named Miss Oliver. She’s very cute, and I can already tell she has a sweet disposition, but… There’s Madame Jasmine. Jasmine has been by my side and sharing my adventures since March of last year. She’s like a trusted digital companion to me – that might sound silly, but she’s been with me so long it just seems like putting out to pasture would somehow be… wrong. So what do people think? 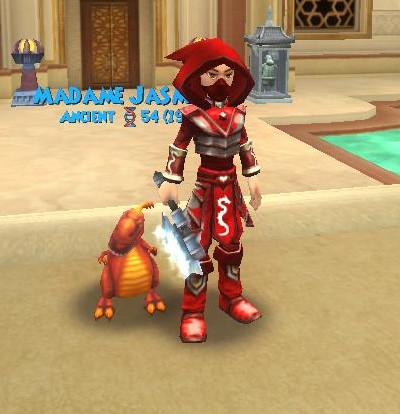 Train up my new Helephant or stick with my faithful sidekick Madame Jasmine? Or a little of both? This entry was posted on July 18, 2011 by dittowizard. It was filed under Wizard 101 . Ditto, I say go ahead and raise your helephant. You can always switch back to Madame Jasmine whenever you like, and I’m sure Jasmine would not mind a little vacation! It’s hard to give up a pet you’ve had by your side for a long time, but the Helephant really is better than the ‘zilla as far as the help it can be to you – at least mine was. On the other hand, if you’re advancing quickly, just wait for the Phoenix pet. It is even better yet! Have you seen the new hybrid found out. it call Fire Beetle. here the link to proof, the combo is fire cat and storm beetle. I think you should train Miss Oliver to adult; see if her talents are good from there train her all the way. If she has one (or more) talent(s) that you really like and so does Madame Jasmine the answer is simple… Hatch! You can also train Miss Oliver and Madame Jasmine to epic (if not already at epic) and alternate depending on talents and enemies. Make the Helephant’s name Sir Jasmine! Then when you wanna change you have to other spells! I would train Miss Oliver to adult (just to see what kind of traits she’ll have) and then give Madame Jasmine a break every so often and just keep the other in your backpack so they’ll be close if the traits work better. For example, if Miss Oliver removes charms and Madame Jasmine gives a life boost, switch to the one you think will help you best. Either way, I’m sure they’ll enjoy working with you. I think you should train Miss Oliver and Madame Jasmine to epic and then use Madame Jasmine for street mobs and Miss Oliver for bosses, or visa versa. It also depends on the talents and what you are fighting. Either way I hope you enjoy your pets as they can get you out of some tight jams. Good luck. I say you should train both Madame Jasmine and Miss Oliver till they are both epic so you can switch between them and if you get a good hatch using them then train the pet you’ll get and use all of the three pets.